Dot your i's and cross your t's for a perfect resume. An ideal resume should be able to multitask as well as you do. A resume should neatly organize your skills, describe your experience and highlight your achievements in such a way that a hiring manager sits up and takes notice, says resume expert Kim Isaacs. 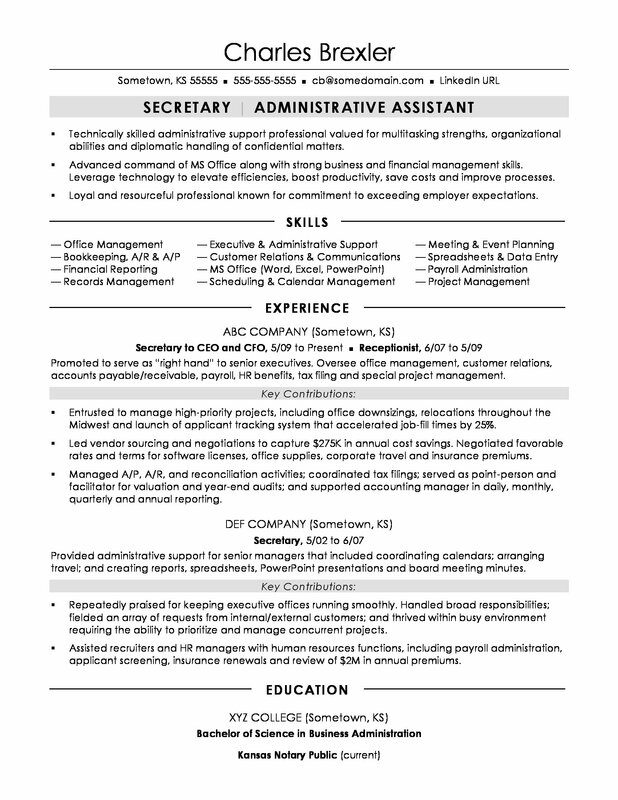 To be a successful candidate for secretary jobs, view this sample resume for a secretary that Isaacs created below, or download the secretary resume template in Word. Secretaries are often the glue that keeps a workplace together and therefore are hired in nearly all industries (which is good news for your job search), though most job openings are in hospitals and schools, as well as government, legal, and medical offices. You'll find the highest level of employment for this job in the following states: California, New York, Texas, Florida, and Pennsylvania; and in the following metropolitan areas: New York City, Los Angeles, Houston, Chicago, and Washington D.C.
As a secretary, you can expect to earn a median wage of $37,870 per year, or $18.21 per hour, according to the Bureau of Labor Statistics. Additionally, you can search for secretary jobs on Monster. Advanced command of MS Office along with strong business and financial management skills. Leverage technology to elevate efficiencies, boost productivity, save costs and improve processes. Loyal and resourceful professional known for commitment to exceeding employer expectations. Promoted to serve as “right hand” to senior executives. Oversee office management, customer relations, accounts payable/receivable, payroll, HR benefits, tax filing and special project management. Entrusted to manage high-priority projects, including office downsizings, relocations throughout the Midwest and launch of applicant tracking system that accelerated job-fill times by 25%. Led vendor sourcing and negotiations to capture $275K in annual cost savings. Negotiated favorable rates and terms for software licenses, office supplies, corporate travel and insurance premiums. Managed A/P, A/R, and reconciliation activities; coordinated tax filings; served as point-person and facilitator for valuation and year-end audits; and supported accounting manager in daily, monthly, quarterly and annual reporting. Provided administrative support for senior managers that included coordinating calendars; arranging travel; and creating reports, spreadsheets, PowerPoint presentations and board meeting minutes. Repeatedly praised for keeping executive offices running smoothly. Handled broad responsibilities; fielded an array of requests from internal/external customers; and thrived within busy environment requiring the ability to prioritize and manage concurrent projects. Assisted recruiters and HR managers with human resources functions, including payroll administration, applicant screening, insurance renewals and review of $2M in annual premiums. As a secretary, you know how heavily the working world relies on written communication. There are no substitutes for clarity, focus, and attention to detail. The same is true for your resume. It's critical that you present your skills and experience in such a way that hiring managers need only spend a few seconds before realizing you're qualified for the job. Could you use a little help perfecting your resume? Get a free evaluation today from the experts at Monster's Resume Writing Service. You'll get detailed feedback in two business days, including a review of your resume's appearance and content, and a prediction of a recruiter's first impression.